Lately I've been making a much more conscious effort to look after my hair. I've ditched the back-combing, cut down on washing, and started taking time out to use deep treatments and hair masks. The thing that I always struggle with when it comes to keeping my hair in good condition, however, is finding a good day-to-day shampoo and conditioner. I go through phases with shampoos and conditioners you see - sometimes I'll be convinced that it doesn't make a difference whether you buy a cheapy shampoo/conditioner or an expensive one, and I will literally buy whatever's on offer, or there are other days where I find myself soughting after the most expensive brand in the shop, convinced it will miraculously transform my hair. I don't always pay attention to what type of shampoos/conditioners I buy either really, but after trying Paul Mitchell's new haircare range tailored for blonde hair, I definitely think I should. 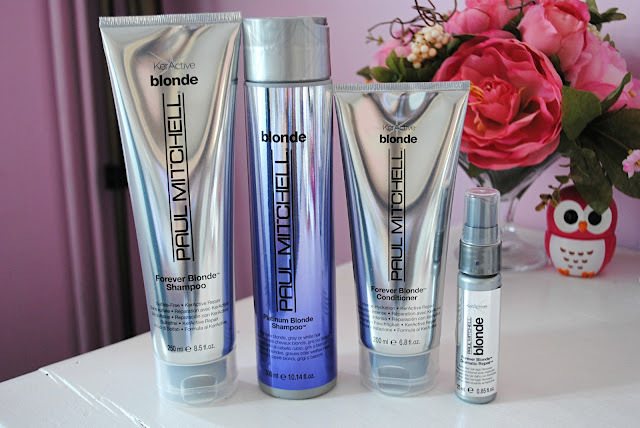 I was recently sent Paul Mitchell's range of Blonde hair products to try out, and considering I have (faux) blonde hair, this was the perfect range for me to put to the test. I never really pay attention to the 'blonde' ranges I see sitting on the hairdresser's/drugstore's shelf; instead I look for strengthening and repairing products. However, it's important to note that as blonde hair is more than likely a little bit frazzled from all the bleaching and colouring, the majority of blonde-specific haircare products take this into account, and contain strengthening and conditioning ingredients. Paul Mitchell's range is no different. All of the products in the range by Paul Mitchell (bar the Platinum Shampoo) contain a unique and exclusive KerActive protein blend that helps to restore and rebuild damaged hair. They are all also infused with safflower oleosomes to help add moisture to the hair, something which blonde hair is always lacking. The Forever Blonde Shampoo is great because it doesn't just cleanse the hair, it nourishes it too, and you can definitely notice this when using the product. It is also sulfate free and so isn't harsh or abrasive on the hair. It's pretty thick, as far as shampoos go, which I really like as it feels like it's looking after the hair whilst cleansing it. The Forever Blonde Conditioner is also extremely thick and creamy, infused with macadamia nut oil, and I absolutely love it as it makes my hair feel so incredibly soft and nourished. The Platinum Blonde Shampoo does a great job of toning my hair down and neutralising brassiness, but other than that it's like most run-of-the-mill purple shampoos. The Dramatic Repair product is a little spray loaded with with all the elements from the other products, in a really light anti-frizz and anti-static detangling spritz. It is great for combing through hair after washing, and gives hair that little extra leave-in boost that it needs for repairing and conditioning. Overall I am so impressed with Paul Mitchell's range of Blonde products. Although I felt the Platinum Blonde Shampoo was a tad underwhelming, I cannot rave enough about the other products in the range. Using the Forever Blonde Shampoo and Conditioner, as well as the Dramatic Repair, my hair has improved in strength so, so much. It feels in a much better condition, is softer and smoother, and I've had lots of compliments about how shiny it looks. I've been struggling to find a shampoo and conditioner that I'm completely in love with, until now. The only thing I will say is make sure you press the lid down on these products properly; they need a firm push to click into place, otherwise you'll end up chucking shampoo down the sink, quite literally (I did this, gutted). Other than that I absolutely adore these products and will most definitely be repurchasing. Paul Mitchell products are available at selected salons and online. Although they're not the cheapest of hair products, they are most definitely worth it. Are you a fan of Paul Mitchell products?